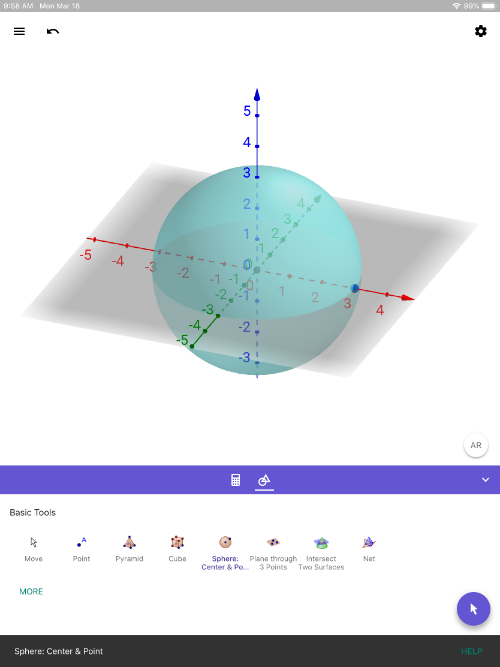 Here's how you can use GeoGebra Augmented Reality within GeoGebra's 3D Graphing Calculator on your iPad or iPhone: 1) Go to App Store and install GeoGebra 3D Graphing Calculator on your device. 2) Open up GeoGebra 3D Grapher. Create any 3D solid. Here, we simply created a sphere by using the SPHERE WITH CENTER THROUGH POINT tool. (This tool is the 5th one in on the left on the top row in the pic below). 3) Next, PRESS THE AR button (lower right within 3D Graphics pane). You'll see everything disappear and you'll see your environment on the screen. Slowly move your device slowly, making sure to AIM IT AT THE FLOOR. Wait a few seconds. Look for a SQUARE to appear. Once you see it, touch anywhere on the screen to place the object in your environment. Use your fingers to reposition the objects. KEY IS TO MOVE SLOWLY. Have fun exploring! 4) Press the 3D button (lower right) to exit AR view.